Capture stunning high-speed video at up to 1280x1024 resolution. Chronos 1.4 are 2.1-HD are purpose-designed, professional high-speed cameras in the palm of your hand. With 1.4 and 2.1 respective gigapixel-per-second throughputs, you can capture stunning high-speed video at up to 1280x1024 resolution with the Chronos 1.4 and up to 1080p (1920x1080) resolution with the Chronos 2.1-HD. 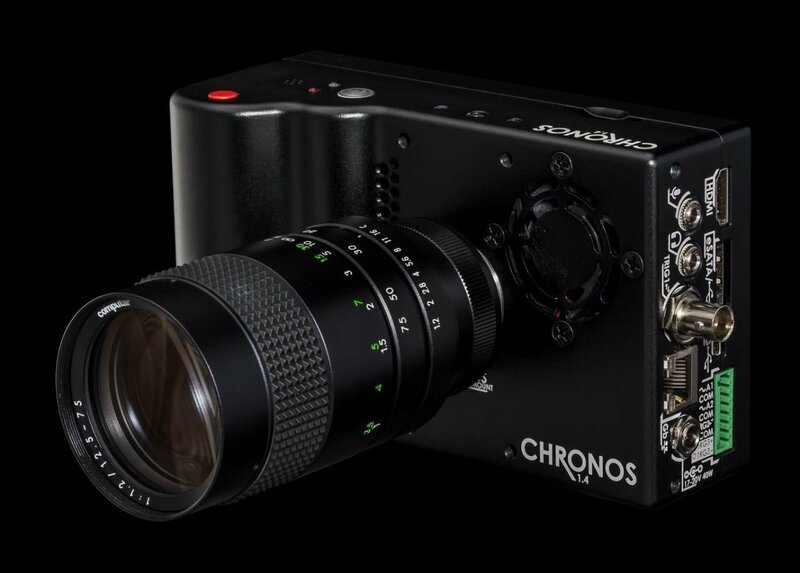 Frame rate ranges from 1,057fps at full resolution, up to 38,565fps at minimum resolution with the Chronos 1.4 whereas the Chronos 2.1-HD offers up 1,000fps at full resolution and 100,000fps at minimum resolution. The pixel throughput remains nearly constant with changing resolution, allowing you to trade resolution for speed. Frame rate is resolution too - temporal resolution, and Chronos lets you choose the best of spatial or temporal resolution for your shot. Available in color and monochrome, and in 8GB, 16GB, and 32GB models for 4, 8 and 16 second record time respectively. Chronos is completely standalone, it can be used like any normal camera - pull it out of your bag anywhere and start shooting. It can also be used tethered via Ethernet for remote control (upcoming software release) and video download in test labs. You can record hundreds of shots - hours worth of shooting - to a single card. We started on the journey that lead to Chronos because we believe high-speed imaging should be for everyone, not just scientific research labs and TV productions with massive budgets. Our passion has resulted in a camera that’s disrupting the high-speed video industry. Cameras with similar features currently sell for around $25k. Chronos is about 1/10th the price, with more features, smaller size, and far better usability. 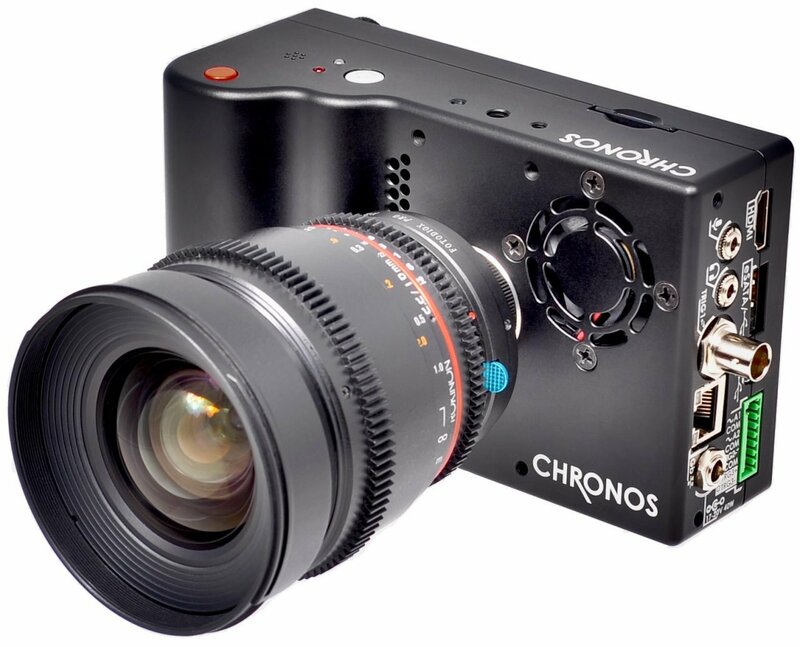 You can buy a Chronos for less than the cost of renting a typical high-speed camera for a week or two! HDMI technology is now available. Ethernet control and transfer is currently being implemented and will be available soon. It will be added in a future free software update. 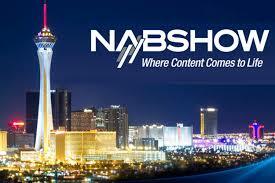 Our team is thrilled to participate at NAB Show 2019 as an exhibitor and comes with exhilarating announcements on the agenda! Kron Technologies Inc is a Canadian high-speed imaging system design and manufacturing company, located in Vancouver area. Make high-speed imaging accessible to everyone. Provide state-of-the-art products for an excellent user experience, at a fair price, with the best possible quality and customer service.